Treasurer Scott Morrison during Question Time in Parliament House. 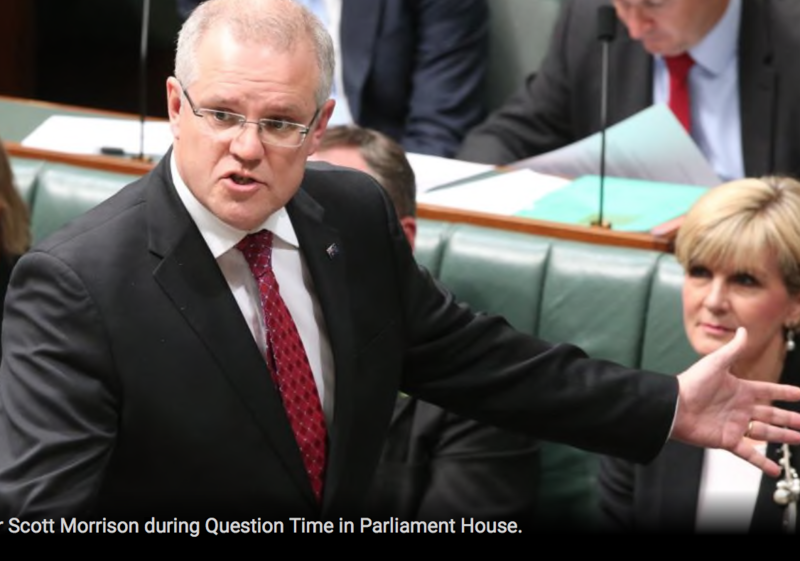 ISLAM will become more Australian over time, Treasurer Scott Morrison said, as debate raged over calls by Coalition MPs for debate about links between Islamic teaching and terrorism. Islam is Islam and that’s it. The creeps who rule over us seem to be infected with a really resistant disease that is incurable. Mr Morrison, who works with moderate Muslim leaders in Sydney, said all religions went through phases, and he believed Islam, like Christianity and Judaism, would become more “indigenised’’. The “moderate Muslim” is as rare as the mythical unicorn. But lets say there are some, does that make Islam “moderate?” Islam is ultimately violent and demands that unbelievers are terrorized, subjugated, enslaved or killed. Does Morrison believe he can “indigenize” the Koran? “I think one of the positive things about Australia is it’s such an overwhelming cultural set of values that those always have an influence over time,’’ he said. Islam is not “other religions”. Islam rules. We are “the others”. His comments come after a string of Coalition MPs, led by Energy Minister Josh Frydenberg, former SAS soldier Andrew Hastie and Victorian MP Michael Sukkar, said there was a problem with Islam and an “honest debate’’ was needed about links between Islamic teaching and extremism. Mr Hastie and Mr Sukkar also called for a modernisation of Islamic teaching. Islam is ‘perfect’. The prophet of Islam said so. Try to change one word and a billion “moderates” will erupt in anger and kill you. The MPs reported positive feedback in their electorates, but some of their government colleagues were furious, saying the comments had alienated almost 500,000 Muslim Australians. “Alienated?” These “government colleagues” should be concerned about alienating 20 million infidel Australians. We are not (yet) in the business of serving Muslims. Several MPs also expressed concern that the comments ran counter to advice from the police and security agencies that the Government’s best asset against terrorism was the Muslim community itself. The police and security agencies are “advised” by cunning Muslim groups who are deliberately misdirecting their efforts. Their advice is useless. “It’s unhelpful at best and at worst disgraceful that we’d go against the advice of all the agencies by further marginalising the Muslim community,” one MP said. Who is this nameless MP who is so eager to advice us not to do anything about the Mohammedan insurgency? Veteran Liberal MP Philip Ruddock, the Government’s special envoy for citizenship and community engagement, took a thinly veiled swipe at his colleagues by reinforcing his view that terrorism was the threat — not Islam. Willful stupidity? Ignorance? Who needs Ruddock in a cushy position to lecture us on something he clearly doesn’t understand? “I do think we need to have a conversation, and it needs to be a conversation that terror has no place in our society,” Mr Ruddock said. “Terror made me victorious”, said Muhammad. Ruddock sounds like a sheep that’s been sold to a halal butcher. In his maiden speech to the Federal Parliament, Morrison paid tribute to the utterly creepy Desmond Tutu and U2 singer Bono for their “humanitarian attitudes to suffering in Africa.” Tutu & Bono are self-serving fraudsters & parasites. I am not impressed. Whatever it takes. It’s a Labor Party line, but nobody has owned it like Malcolm Turnbull. You thought he’d go quietly? Malcolm Turnbull? He was never going to go quietly. Even so, let’s consider the ruthlessness with which the Prime Minister dealt with his Liberal Party colleagues yesterday. Truly it was something to behold. This was Malcolm at his cool, menacing best. Assassinate me? You better not miss. Faced with a second challenge by Peter Dutton in as many days, here is what Turnbull says he’ll do if the party dares try to remove him: he will quit parliament. This would, of course, plunge the Coalition government into chaos via a by-election in Turnbull’s seat of Wentworth. The government has only a majority of one seat in the house. It would become a minority government, at least until the by-election. And there’s no guarantee it could win Wentworth without Malcolm. So he’ll bring down the government. Or trigger a federal election. But that’s not all. Turnbull also intends to bring down Dutton, personally. He was seeking to mortally wound him on what may have been the last day of Turnbull’s political life. 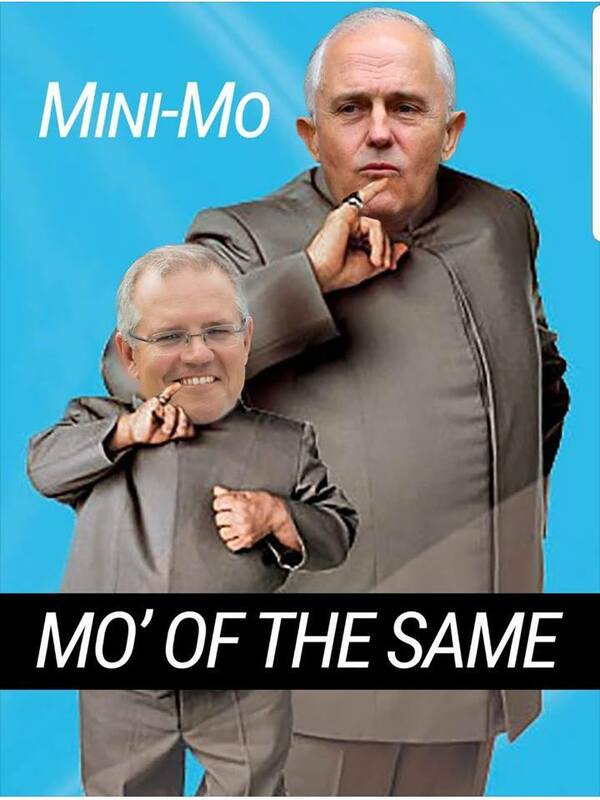 He said there was a constitutional cloud over the head of his rival, and it would be for Dutton to convince the Governor-General that he could form a stable government, without Malcolm in his seat. If not, we’re back to the polls. Oh, how badly the government doesn’t want to go to the polls. It would be annihilated. And Turnbull still wasn’t done. Before any of this could happen, he also wanted to see a letter with the signatures of the 43 insurgents who apparently want his head. He wants their names. If that is not menacing, what is? But why are we surprised? Turnbull has always been ruthlessly ambitious. Whatever it takes. That’s a Labor Party line, but nobody has owned it like Malcolm. MORE: Turnbull’s biographer Paddy Manning writes “he was never in right party’’. At school he apparently told the other kids he’d be prime minister one day and look, sure, how many precocious youngsters from the boater-and-blazer schools have said the same over the years? Plenty. But Turnbull meant it. When ABC executive John Lyons profiled Turnbull in the 1990s, a friend quoted Malcolm as saying he wanted to be prime minister by the age of 40. “For which party?” the friend inquired. Turnbull reportedly said he didn’t really care. It was the same when he worked for Kerry Packer. In 1991, the billionaire was part of a consortium trying to buy Fairfax. The deal went bad, and Packer blamed Turnbull, accusing him of leaking deals, if not to rivals then at least outside the group. That’s the same song you heard yesterday. Turnbull stayed in business just long enough to make a personal fortune. Then, according to multiple sources, he approached ALP figures, seeking their endorsement to join the party. Five years later he won preselection as not the Labor but the Liberal candidate for Wentworth. And never mind that the Liberal Party already had a candidate for Wentworth in Peter King. Turnbull coolly knifed him and carried on. He won the seat in the old-fashioned way: chasing down every vote in the surf lifesaving clubs and the RSLs. There was no event that Turnbull would not attend. I saw him at the opening of the kosher butcher section at Coles, Bondi Junction. He got elected. John Howard, as astute an operator as ever there was, was wary. He, like everyone, could smell Turnbull’s ambition from space, and he kept him at arm’s length. Turnbull sat back, and waited. Not happily or patiently, but he waited. After Howard lost in Bennelong, Turnbull saw an opening and tried to run straight through it, losing to Brendan Nelson in his bid to be opposition leader, before winning the second time around. But the skills that saw him rise — impatience, rapaciousness — soon got the better of him. Turnbull wanted Kevin Rudd’s job, not later but right then, and so Utegate was upon us. That led to Tony Abbott becoming prime minister, and Turnbull again had to wait for his moment to strike. Thirty Newspolls. That was his trigger. Couldn’t he see how it might come back to bite him? He’s never been all that good at politics. His decision on Monday to call a leadership spill is a case in point. It was done to take the fight to Dutton, and it backfired because suddenly everyone could see how close the fight really was: 48-35, meaning just seven votes separated Dutton from the Lodge. Why so rash? Because Turnbull has too much confidence and too little political nous. He’d have looked at Dutton and thought: They’re going to vote for this guy? This plate-faced former cop from Queensland? Over me? No. Also present: his belief in his own ability, which never wavers. These events of the past week, they really have nothing to do with his competence or performance. This was mutineers visiting chaos upon his government. He then became one. No, he would not permit a leadership spill until he had personally seen the signatures of all those colleagues who wanted him gone. “People have to be accountable,” he said. He cast menacing doubt on whether a list of names of insurgents had ever existed. “I read in the press (it) is already in place, but perhaps maybe it isn’t,” he said. In finishing, Turnbull said he didn’t want to bring emotion into the battle, and yet he was smiling. Why? Maybe because he’s rich and happily married, with grandkids and options. Maybe this is the kind of war — petty, and largely pointless, against lesser foes — he still thinks he can win? Here’s another idea: Turnbull’s never been much good at politics, but revenge? He’s always been very good at revenge. Why not burn the house down? With some luck, he might even get to drag Abbott’s corpse out with him. For Turnbull, that may well be the sweetest victory of all. 1/ Australian Prime Minister Malcolm Turnbull speaks to the media during his press conference at Parliament House in Canberra yesterday. I would argue that Scott Morrison and Josh Frydenberg are a bit of an improvement over Malcolm Turnbull. You got LABOUR in “government” ! You got LNP in “government” ! You got any GREENs as “authorities” ! … None will do Australia “anygood” ! … Remove and “incarcerate“ All The Above – The LOT !!! … None are in Australia’s “BestInterests” ! You Got the above fixed ! … STOP invader islam & criminal African tribal immigration !!! … REVERSE invader islam & criminal African tribal residency/citizenship !!! Start cloning – Fraser Annings !!! … every one will do Australia proud !!! … just get rid of the islamophiles islams islam and criminal African tribals !!! DREAM FOR A BROTHERLY CONVERSATION WITH MR MORRISON. Thank you Sheik, for expressing so graphically, and so vividly, the distress that many of us are feeling this morning – especially those of us who reside north of the Tweed. All those Queensland seats that were at risk under Turnbull are still at risk, but I doubt Sco-Mo will work that out, until its too late. The fiery, flame-haired lady from Ipswich will continue to be a major beneficiary of the Labor-lite LNP. And thank you Caroline Overington, for your brilliantly perceptive analysis of the true character of our sometime Prime Minister.